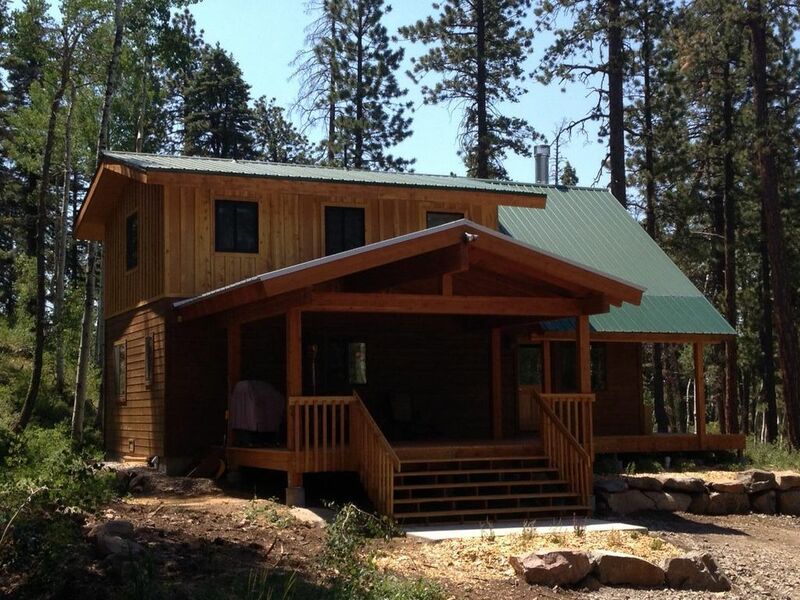 Our 1200 Sq ft, 3 bedroom, 3 bath, customs home was completely remodeled in 2013 and offers the most privacy and seclusion of any property near Purgatory as it sits on 132 acres, yet is less then 2 miles from the ski resort and 25 miles from downtown Durango. VRBO Listing 716605 is also on the property (1/4 mile away) and features 2 bedrooms, 2 baths, and sleeps 6, if your group is bigger than our 3 bedroom alone can accommodate. The kitchen is outfitted with stainless steel appliances and granite countertops. The main living space features a 46 inch flat screen TV and wood burning fireplace (wood provided). The master bedroom has a king size bed, the other two bedrooms both have queen beds. The property borders the Weminuche national Forest on the North and East, which is the largest and most unused wilderness area in the continental U.S. Their are numerous lakes and ponds on the property, and a road to higher elevations where the views of the surrounding mountains and lakes are spectacular. It is common to see bear, deer, elk, big horn sheep, snow shoe hares, ducks, geese, turkey, coyote, marmot, and the occasional mountain lion or moose. All of the pictures in the listing were taken from the property. A 4WD/AWD with good tires is required December through March. If you plan to drive a vehicle not so equipped, please book elsewhere. Although the roads are extremely well maintained, we want to ensure our neighbors are not adversely impacted by our guests who may not regularly drive on snow packed roads. Lastly, we love dogs, and they are totally welcome as long as they are well behaved and get along with people and other dogs. Lucy runs free on the property. Sean grew up in the area, skiing every weekend at Purgatory, and graduating from Durango High School before leaving to experience life outside this rural community. After 25 years, he and Leslie decided to move back to the mountains of Southwest Colorado to be close to family and all of the outdoor activities they enjoy. This area is the Saudi Arabia of solar energy, with plenty of water and lots of trees. It is easy to build a comfortable and highly sustainable life here. All of the houses, barns, and greenhouses were built using wood harvested from the property. The 27' x 110' greenhouse provides fruits and vegetables not only for Sean and Leslie, but for a number of other families in the area. Standing dead trees are harvested and provide a backup heat source for all the homes and buildings on the property, with an additional 120 cords of wood harvested for sale, providing a carbon neutral source of heat. The trees are harvested primarily to improve the health of the forest. There is nothing better than cozying up to a real wood fire after a full day of skiing, watching the snow fall during the winter, or lounging on the covered deck and watching the sun disappear over the mountains during the summer. The kids will have a great time exploring the forest, fishing in the nearby creeks or lake, biking, horseback riding or the many other activities close by. We are less than 2 miles to Purgatory Ski Area and Resort. Purgatory features 1605 skiable acres, over 2000' of vertical, 99 Trails, 12 lifts, and 5 Terrain Parks. The property sits on 132 private acres and is bordered to the East and North by the San Juan National forest, with over 2 million acres. The view off the porch, and out the wall of windows facing West, is of the Hermosa Cliffs and Castle Rock. Purgatory Ski Area is less than 2 miles away. The cabin is gorgeous with beautiful outside views and our dogs loved playing in the snow! We had plans to be in downtown Durango during all of the days we stayed but ended up spending a whole day in the cabin because it’s so relaxing. Our kids were sad to leave, it was a perfect vacation. I'm curious what a family from Louisiana thought of all the snow? Happy to get back home, or are you all ready planning another ski trip? We're glad you all had a good time! It was absolutely beautiful and perfect for our family. It's secluded in the forest, very quiet and peaceful and literally 2 miles from Pergatory Ski Resort. The Owner's take very good care of this home, it was clean and had everything we needed including plenty of fire wood! There was record snowfall while we were there and Sean was out at 6:00 in the morning plowing and making sure we could get out to go to the Ski Resort. Glad your family enjoyed their time in Colorado. I assume you have Mother Nature on speed dial. You couldn't have picked a better time to enjoy the powder! One of our favorite places to stay! This is our second visit to this cabin and we love to stay here. Very comfortable with all the amenities needed. The rooms are spacious and the beds are so comfortable. The land is private and incredibly peaceful. We hope to make it an annual family trip to stay here. We hope you do visit every year. It will be neat to see Olivia grow up. Maybe next year i’ll Get more than a “hi” out of her🙂. It was great to see you all! Amazing cabin and awesome owner! This cabin surpassed all expectations! Everything was beautiful from views to decor. It was so great, we decided to stay there for an entire day of our vacation. We had a fire in the fireplace, roasted marshmallows and hiked around the property. We were able to meet Sean the first day as he lives on the property. He was so welcoming and friendly! We will definitely be going back!! Samantha, you southerners are so nice. I really enjoyed meeting the family! Thanks for visiting! An great house with awesome owners in a wonderful location. Thanks for rescheduling your visit for after the fire was extinguished. Great to see you both. Looking forward to seeing you all again next summer! Until Confirmed, rates are subject to change. 25% deposit is required at time of booking. The full remaining amount including cleaning fee, damage insurance and taxes, is due 30 days prior to scheduled arrival date. When canceling more than 30 days in advance, quest will receive a full refund. When canceling within 15-30 days of scheduled arrival date, quest will receive 50% of their payment. There is no refund when cancelling 14 days or less of the arrival date.